Lee "Scratch" Perry, the legendary reggae producer, provocateur and dub pioneer, will headline the 21st edition of the Llangollen Fringe Festival on Saturday 25th July. Grammy award-winning Perry (pictured) has been highly influential in the development of reggae and dub music world wide. Working under many names - as well as in many capacities including disc jockey, producer, record businessman, songwriter, singer - he has been a guiding force in the development of reggae. In addition to his own trailblazing music, Perry has produced hits for the Wailers, Junior Byles, Max Romeo, the Heptones, Gregory Isaacs, Junior Murvin, and the Clash. 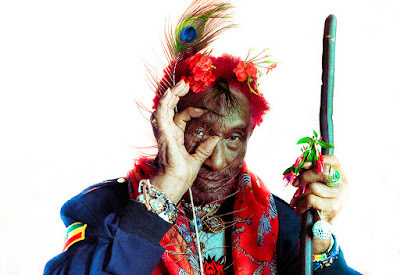 Known for his bizarre behaviour and stream-of-consciousness interviews, he often dons costumes and headdresses made of found objects such as feathers, toys, playing cards, and coins. Perry is joined on the festival's bill - its biggest to date - by Eliza Carthy & The Wayward Band, BBC 6 Music Radio's Craig Charles and Mark Radcliffe (appearing on separate nights) and Linton Kwesi Johnson. There will also be stand-up comedy and the return of Band For a Day, the music-themed Steam Train and Aqueduct Boat trips trips, and many other events. The festival rounds off with its iconic closing concert in the stunning surrounds of Valle Crucis Abbey, which this year will feature the ethereal sound of Golden Fable and the New Sinfornia Orchestra. * Full listings tickets for the whole festival are on sale now priced at £80. This allows access to all of the main events across the 10 days. Tickets are available from www.llangollenfringe.co.uk, or by calling the Fringe box office on 0800 1455 779.